This book won the Booker prize in 1990 – that is why I decided to read it. Whether I enjoyed it or not is something of an enigma. The story is split into two different ages – that of the Victorian poets, Randolph Ash and Christabel LaMotte, and that of the modern-day researchers, Roland Michell and Maud Bailey. Roland is studying the work of Ash, and Maud that of LaMotte. Their paths cross when Roland tries to investigate a reference he found to a meeting between Ash and LaMotte that suggests there was a liaison between the two. 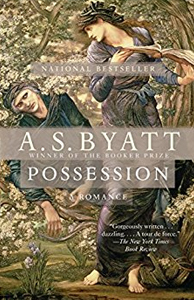 The book contains a great deal of poetry written by Ash and LaMotte in Victorian style (as they are fictional characters, it is all written by the author, Byatt). I found the poetry difficult to follow and tedious to read and I started to skip it, and then realised that I could do so without losing anything of the story. The narrative switches between the developing relationship of Ash and LaMotte and the investigative efforts of Roland and Maud. The current day part of the book also relates the rivalry between researchers in different universities and parts of the world and shows up petty jealousies and possessiveness. Apart from the poetry that heralds the change in era, the Victorian times are written about with a formality that distinguishes them from the modern 20th century parts. 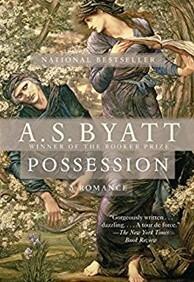 Byatt’s change in voice and her swathes of poetry are testament to her tremendous ability with the English language. I found the Victorian era passages to be more believable and enjoyable to read (excluding the poetry), rather than the modern times which felt simple and lacking in character. Perhaps that is what Ms Byatt sought to achieve. One thing I found fascinating was that this was written before email and Google and so their research efforts were arduous compared to how easily we would do things in this internet era. My assessment of this story is that it was enjoyable if I left out large parts of it. So there is the enigma. Can one be said to have enjoyed a book if one ignored a large part of it? I’m sure the Booker prize was awarded for Ms Byatt’s dexterity with the language and the intricacy of the content.